Breakfast Served Anytime by Sarah Combs. Candlewick Press, 2014. Currently available. Face Value: This is a subtle, beautiful cover. 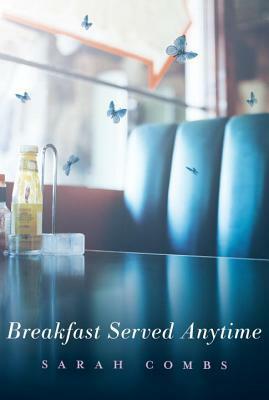 The Egg Drop diner is a key location in the book, and the blue butterflies are part of the magic of this story. I like the cover, but it may be too subtle. This book is wonderful. It deserves a cover that stands out on the shelf, and this one does not quite do the trick. Does it break the slate? Yes, it is terrifically slatebreaking! Gloria is an articulate young woman who unabashedly admits that she has a lot to discover about herself. I especially love that Gloria gets that she isn’t “finished” yet. She has a lot of growing to do, and she acknowledges that she may change her perspective as she gains life experiences. Gloria is surrounded by a cast of interesting young people who also challenge the status quo. Who would we give it to? This book is all about smart kids who go to Geek Camp. These are the young people who thrive in their own intellect. They may not be musicians or athletes or dancers, but they can hold a debate like nobody’s business. Similarly gifted young readers will love this book and want to have a Geek Camp experience of their own. Review: Gloria has signed herself up for a summer at the prestigious Geek Camp (don’t worry, not the official name) at the University of Kentucky. UK offers this camp every summer in an effort to keep Kentucky’s best and brightest young people in the state. Although many famous and talented people come from Kentucky, they don’t stay there. In an effort to stop this brain drain, UK offers a choice scholarship to all Geek Campers. It’s up to the campers as to whether they accept the scholarship and the subsequent four years spent close to home, or take their chances in the big bad world outside of Kentucky. I had read positive reviews about Breakfast Served Anytime, but I was simply not prepared for the way this book affected me. I have not been moved by a book in a long time. This little book reached out its tender hands and wrapped me up in a big hug. It made me feel warm, nostalgic, hopeful, and sad all at once. I attribute this to Combs’ delightful writing style and her marvelous characters. Gloria is the most notable character, and will likely be the most relatable for girl readers. She grew up in a single parent household with a loving father. Gloria is a little scarred by her past, but not too much. She can survive. She knows that even though she has had a tough time, other people have had worse. Gloria is incredible sensible. When was the last time you read a lead YA female character who was sensible? Gosh, I can’t even remember. Gloria is amazing. Gloria has a romantic interest and it is a comical endeavor. He drives her nuts, she pushes his buttons. They are Beatrice and Benedick both in real life and in a theatrical experiment on stage. Sure, you could see from the moment they first encountered one another that they would become entwined. But there was no suspense needed in this relationship. A slow burn was just as lovely to read. And even though romance had a role, it was not the star. Gloria’s friendships were just as important and infused with just as much love as her budding romantic relationship. The friendships in this story were admirable and something that readers of any age should aspire to. This book is a story of a life-changing summer for all of the young characters. It gave me the most wonderful warm and fuzzy feelings. Even though I was reading it on trains and in cars, the terrific writing made me feel as if I was basking in the sun. This entry was posted in Reviews, Uncategorized, Young Adult and tagged geeks, Kentucky, Shakespeare, summer camp. Bookmark the permalink.